While people with fair skin are more likely to develop skin cancer due to sun exposure, people with dark skin tones are at risk of more serious kinds of cancer when they get it. The American Academy of Dermatology recommends that EVERYONE wear sunscreen daily for the safety of their skin. Although zinc oxide is the safest and most effective active sunscreen ingredient, the best protection from the sun is to seek shade and cover up with clothes, sunglasses and a hat. Try to avoid peak hour sun between the hours of 10am and 4pm. Always stay hydrated. Young children need even more protection from heat and sun. Don’t Forget, The Sun Is Good. 20 minutes of daily sunlight (without sunscreen) gives you a healthy dose of Vitamin D, which is essential for good health. For the rest of the day, you can trust SOULAR ORGANICS to keep you safe. Just because a sunscreen has a high SPF does not necessarily mean that you are being protected from damaging UVA rays. SPF is only a measure of how well a sunscreen protects you from sunburn, which you get only from UVB rays. UVA (ultraviolet-A) is a longer wavelength of sunlight that makes up 95% of all UV light reaching the earth's surface. It passes right through clouds and glass, and it is pretty much the same strength throughout the day and the year. Currently the US and Canada do not require sunscreens to offer any UVA protection. Many sunscreens on the shelves, even those intended for babies and kids, offer little or no protection from UVA rays. UVA rays penetrate the skin more deeply than UVB rays and are primarily responsible for premature skin ageing and wrinkling. UVA rays have also been shown to cause more skin damage at the cellular level. UVB rays damage the outer layers of the skin. They are the main cause of sunburn and play a key role in the development of skin cancer. SPF (Sun Protection Factor) refers to the amount of protection against UVB rays a sunscreen offers. This amount is measured in percentages and is not a linear scale. 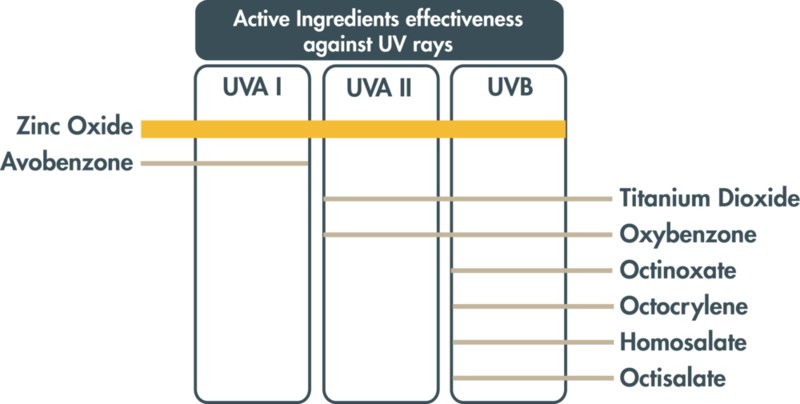 Above is the approximate percentage of UVB rays blocked depending on SPF rating. The difference seems minimal, but a higher SPF helps if you are fair skinned or have a history of skin cancer. Remember, no sunscreen blocks 100% of UV rays. Sunscreen, whether SPF 15 or 70 needs to be applied and reapplied properly. An SPF of 30 does not mean that a sunscreen protects your skin for 2xs longer than SPF 15. It does not measure a product’s ability to protect your skin from UVA rays, which are also damaging. Zinc oxide is one of only 17 active ingredients currently approved by the FDA for use in sunscreens. Upon application, zinc oxide particles sit on the outermost layer of your skin, the stratum corneum, where they scatter, absorb, and reflect ultraviolet radiation, protecting your living skin below. Zinc oxide is unique among sunscreen ingredients in that it is truly a broad-spectrum blocker, protecting from UVA, UVB, and even UVC. Titanium dioxide is another mineral active ingredient you may see in other brands' sunscreens. While it protects from UVB rays very well it does not protect from UVA as well as zinc oxide does and is harmful for Corals in the Ocean. Many mineral sunscreens use nano sized zinc oxide because it is less whitening and therefore more aesthetically appealing than larger particle zinc oxide. There are studies showing that very small nanoparticles (smaller than 35nm) of uncoated zinc oxide and uncoated titanium dioxide can be harmful to the environment by being toxic to marine life. The extremely small size of these particles generates oxidative stress under UV light potentially causing cellular damage to sensitive organisms such as coral or juvenile fish and invertebrates. Chemical sunscreens use only non-mineral, or chemical active ingredients such as Oxybenzone, Oxtinoxate, and Octisalate. Chemical sunscreens need 20 min to become effective. They absorb UV rays into the skin and a chemical reaction turns the harmful rays into heat, which is then dissipated from skin into the air. When this chemicals absorb, they also make their way through the bloodstream, where they've been linked to health issues from allergies to infertility and cancer. Furthermore, they wash off into the Ocean killing the reefs and marine resources. Mineral sunscreens are those that work 'physically' by using the mineral Zinc Oxide and/or Titanium Dioxide as their only active ingredients. Natural minerals reflect UV rays, acting as a physical barrier to protect your skin from burning and aging. They rub in sheer and are immediately effective. Because minerals aren't absorbed, they are safe and gentle on sensitive skin, and just as gentle on the planet! A recent study shows that 97% of Americans have oxybenzone in their blood. This is one of the most common and most toxic chemicals found in conventional sunscreens. Oxybenzone, is also a known hormone disruptor that is not recommended for use on children. Avoid sprays or powder sunscreens at all costs. These types of applications expel excess amounts of chemical ingredients which are inhaled and pose a health hazard. Additionally, these chemicals go airborne and indiscriminately pollute the environment. Apply the correct amount. In order for sunscreen to be effective as advertised, the correct amount must be applied. The FDA regulates that all sunscreens must be SPF tested in the amount of 2mg of formula per square centimeter of skin. What this means is that an adult wearing only shorts must use one full ounce of sunscreen per application to cover all the exposed skin properly. Approximately a teaspoon size amount is needed to adequately protect the face, ears and neck. Using less than the correct amount drastically reduces the sunscreens ability to protect the skin and the SPF claim will not be met. Nonetheless our formula goes a long way and you may not need that much to get full coverage. Try it out!